I’ve also updated an old raincoat using colourful buttons & pretty bias binding, made myself a handy rucksac bag for handsfree walking around Bristol & shortened a pair of jeans without losing the original hem. So I’d say that means I am on track – hooray! Choose styles that suit you. This is one of the most challenging things about making your own clothes because you can’t try it on first! Now I’ve made these first 4 garments for 2015, I’m not sure that any of them are really the most flattering fit on me! 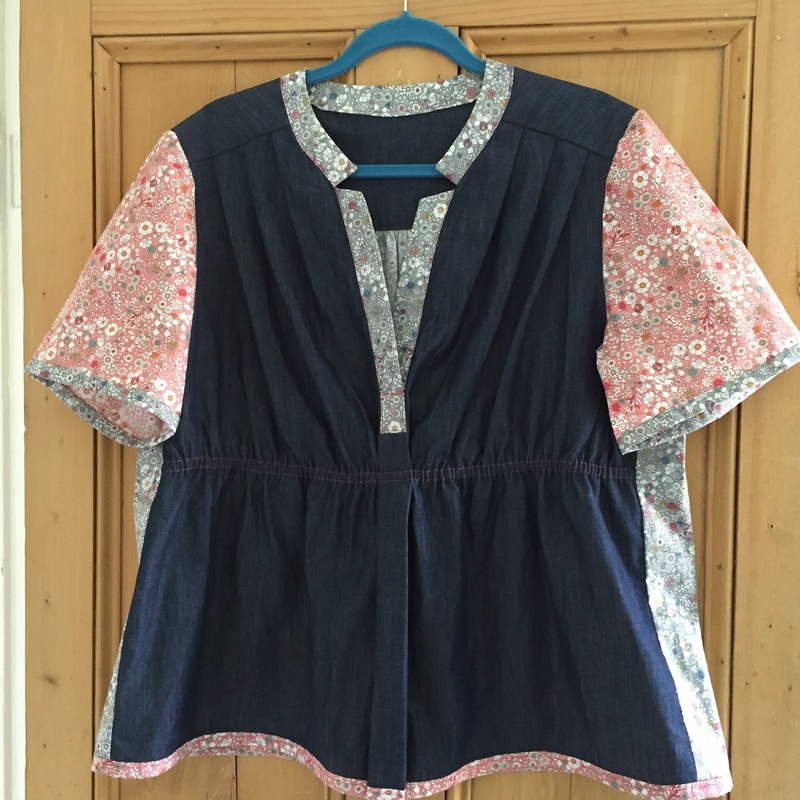 For the shirt, I was given the dark chambray fabric, then I found the lovely floral Rose & Hubble fabrics at Fabrics Plus in Downend & knew I wanted to mix the two. I chose the pattern on this basis & didn’t really stop to think how well the style would suit my shape. I have ended up by shortening the sleeves & adding an elastic strip across the front & I think I’ve saved it! On a positive note this has given be confidence to do my own pattern hacks – I think I’ll be using the elastic strip again. Face the fear & revamp! 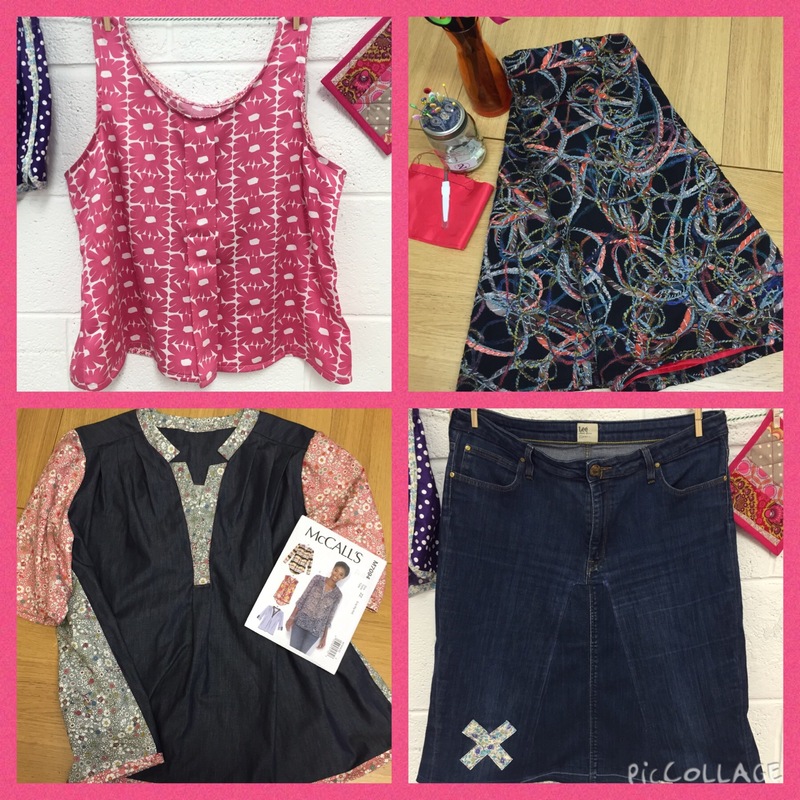 Have confidence in grabbing the sewing shears & boldly cutting into old clothes! If you’re not wearing it, you’ve got nothing to loose & everything to gain! 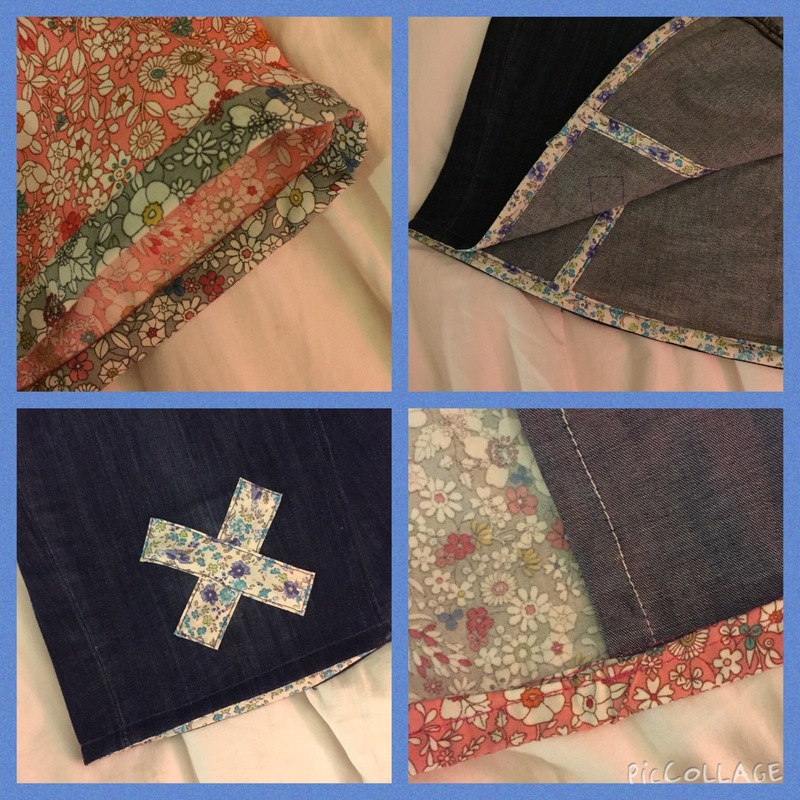 I’m thrilled with my jeans to skirt revamp. Yes there may be a few things I would improve on next time, like allowing a wider seam allowance, but that is part of the joy of sewing for me. I’m also thrilled with my new buttons and trimmings on the coat, it’s now my ‘happy’ coat! Take your time & add the finishing details. One of the best things about making your own clothes is that you don’t need to watch the clock or be thinking about the cost of the time that you put into it. 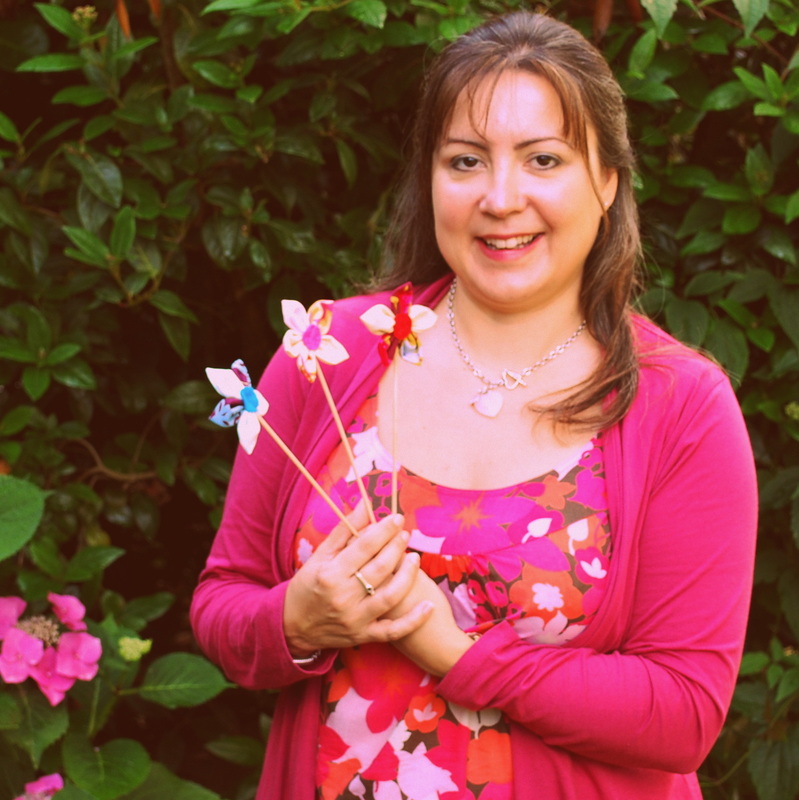 You will not regret unpicking anything you are not happy with or taking time to personalise your makes with quirky touches. I am very pleased that I have either lined or used french seams wherever possible & bound most of my hems. These are not finishes that you would typically find on high street buys so once you know how, they are a simple way to take your clothes to the next level. 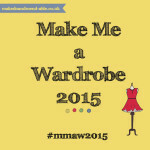 So as I continue on this #mmaw2015 challenge I am going to notice the styles of my favourite fitting spring / summer clothes & do my best to select patterns with nips & tucks in the same places. I may even have a go at creating my own pattern from one or two. I’m also going to enjoy the process of making my own wardrobe & look to keep adding my personal touch. That’s just the shortlist, I’ll let you know how I get on! 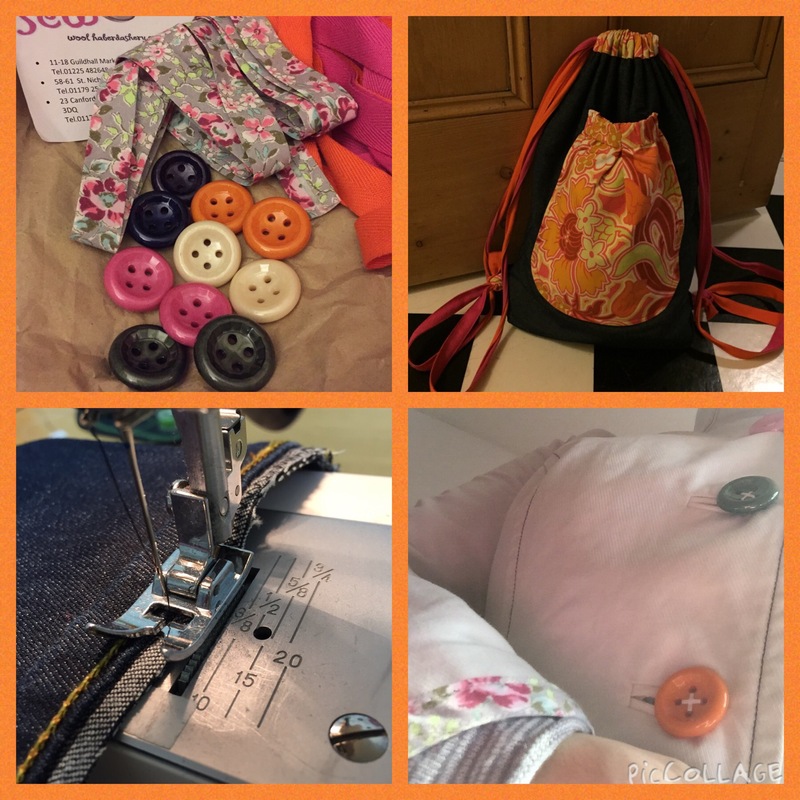 I’d love to hear about the clothes you have been making and any lessons you have to share.